Players are expected to maintain a reasonable level of decorum at all times. Standard poker etiquette will be enforced. In its sole and absolute discretion, PokerStars Live Staff may impose penalties ranging from a verbal warning escalating up to exclusion from all PokerStars Live Events and PokerStars Live operated Cash Games. Advise or criticize play before the action is completed. Discuss hands or strategy with any spectator. Seek or receive consultation from an outside source. Exposing and Mucking – Players who show their cards to a player who has already folded and then fold their cards themselves may receive a penalty. Dealers upon seeing this are instructed to hold those cards outside of the muck and show them to the entire table when the hand is completed. Players doing this repeatedly will be penalized. Collusion – Poker is an individual game. Soft play, chip dumping, etc... will not be allowed and may be subject to penalties. Etiquette Violations – Repeated etiquette violations will result in penalties assessed by the staff. Examples include, but are not limited to, unnecessarily touching other players’ cards or chips, delay of the game, repeatedly acting out of turn, splashing chips, intentionally betting out of reach of the Dealer, or excessive chatter. In addition, excessive celebration through extended theatrics, inappropriate behaviour, or physical actions, gestures, or conduct may be penalized. These violations also include abusive behaviour towards other players’ playing styles and/or berating players for how they have played or are playing the game. Foul Language – The abuse of other players, PokerStars Live staff, venue staff or other personnel will not be tolerated. Foul, obscene or offensive language directed at any player or staff member may result in a penalty. Repeated non-directed foul, obscene or offensive language may also result in a penalty. All participants must behave in a courteous and civil manner during all games and in all tournament and gaming areas. Any individual who encounters inappropriate behaviour on the part of another individual should immediately contact the staff. This shall include, but is not limited to, any player whose personal hygiene or health has become disruptive to the other players seated at their table. The determination as to whether an individual’s personal hygiene or health is disruptive to other players shall be determined by the staff which may, in its discretion, implement sanctions upon any such player who refuses to remedy the situation in a manner satisfactory to PokerStars Live. Any player who intentionally breaks, rips, or defaces cards will be dealt out immediately. Should the player feel they were dealt out unfairly; the issue must be raised with the staff immediately. PokerStars Live and/or the Staff may penalize any act that, in the sole and absolute discretion of PokerStars Live and/or the Staff, is inconsistent with the official rules or bests interests of the Game. If a player is permitted to return to a game after disciplinary action, there will be no refund on any missed collections or blinds, the usual missed-blind rules for that game will apply. PokerStars Live reserves the right to refuse gaming services to anyone at any time. PokerStars Live reserves the right to refuse the sale of alcoholic beverages. 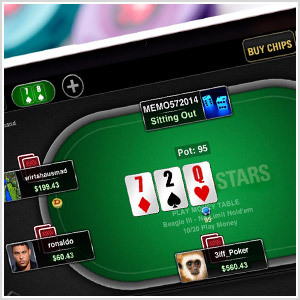 PokerStars Live is not liable for monetary discrepancies caused by player or dealer error. There is no transfer of liability. In the case of theft or natural disasters, PokerStars Live will not be responsible for chips, money, or personal property lost. PokerStars Live is not responsible for the behaviour of its patrons or any resulting consequences. All players who want to sign up for any cash game may be required to register for a PokerStars Live account. Further details will be provided on site. Players may leave the game at any time and bet in any way they choose, within game rules. A player who has remained away from the table for longer than one hour (or has their table closed down while they are away) will have their chips removed from play and stored by the Floor staff if there is a waiting list for their game. The chips will be counted by the floorperson and one other staff member, signed for and stored. PokerStars Live management reserves the right to make decisions in the best interest of the game and in the spirit of fairness to all players, even if a technical interpretation of the rules may indicate a contrary decision. All decisions made by the floor person are made in the interest of fair play and are final. If an irregularity within the game occurs it must be called to the attention of staff immediately. Any objection must be made before the deck is shuffled for the next hand. Players are responsible for protecting their own cards at all times. This can be done by keeping a chip, card protector or their hands on their cards. The dealer will assume that any unprotected, abandoned, or discarded hand has been folded. This holds even if a hand is face up, and regardless of whether a player is facing action. Players who fail to take reasonable measures to protect their hand will have no redress if their hand is removed by the dealer. Contact of an unprotected hand with a discarded card will make the hand dead if there is any doubt as to which cards belong to the hand. Dealers can assist in reading hands if required, but it still remains the responsibility of the player to protect the cards. Players may only speak English while a hand is in progress. If an active player speaks any other language during the play of a hand, his hole cards may be turned up for all to see. If an inactive player speaks in a language other than English while a hand is in progress, a floor person may enforce a penalty. Players should not splash the pot or generally make any gaming actions designed to hide their intended action. Deal-making is not allowed and could result in penalties being enforced. This includes making chops, ‘taking money back’, or otherwise altering the money entering the pot, or won, in an individual hand. Players may chop the blinds if that situation is applicable. Rabbit Hunting – In cases where hands are concluded prior to the last card being dealt, the next card to be dealt will not be exposed under any circumstances. The practice of revealing cards that would have been dealt is referred to as ‘rabbit hunting’ and is prohibited. The person wishing to play over is first on the waiting list. The player who is being played over has up to one hour to re-join the game or his chips will be picked up and his seat will go to the next player on the waiting list. No person(s) may play another player’s chips. Players are not permitted to give their seat to another without a floor person’s prior approval. Only chips or cash on the table at the start of a deal will be in play for that pot, except where specified in rule 28.3. All chips and cash must remain on the table until a player quits the game, except to pay for casino products and services. Players may not pass any chips, except for an ante in stud games, or one ‘lucky chip’ in all other games (smallest denomination for the game only). Chips that are in transit from the cashier by a house runner are treated as being in play, provided the house has given its consent and the other players have been informed. If a player passes chips to a player who is waiting for ordered chips, the amount being passed will play behind. A player buying chips is required to declare the amount being bought. If a player requests a hand and looks at it without specifying the amount being played, he/she may not play more than the amount of the minimum buy-in for that game. In Hold’em and Omaha, the hand closest to button, clockwise. In Stud, the hand with the highest card, using suit rankings to break a tie (spades, hearts, diamonds, clubs). In High/Low games, the high hand. When players draw cards (for the button in new games, for available seats when a game breaks, etc), and tie in rank, ties will be broken using suit rankings: spades, hearts, diamonds, clubs. A player, who is called from the waiting list, must present themselves within five minutes, if not, the next player will be given the open seat and the “no show” player will be posted at the end of the waiting list. A new player must make a full buy-in for that particular game, usually 50 times the Big Blind. An existing player is allowed to re-buy once for half of a full buy-in. If the limit is increased in an existing game, thereby increasing the buy-in, existing players are grandfathered; they may play the chips they have on the table at that time. Thereafter, the increased buy-in applies to all players. A player forced to transfer from a must-move game to a game of the same limit may continue to play the same amount of money, even if it is less than the minimum buy-in. A player who voluntarily changes games or comes from a broken game must buy-in for at least the minimum buy-in amount. New players must post the amount of the big blind before being dealt in. They may post from any position, wait for the big blind, buy the button, or straddle. Should the blinds pass , they will get a missed blind button and be required to wait for the big blind, or post both blinds, or buy the button. Players may ‘buy the button’. A new player or a player with a missed blind button may enter the game in the small blind position by posting both blinds. The big blind amount plays. On that hand, the dealer button is on the player’s immediate right, and no one else posts blinds. On the subsequent hand, the player who ‘bought the button’ gets the dealer button and the blinds resume as usual. All blinds are ‘live’. The money plays, and the players posting blinds have the option to raise before the flop (unless the betting is already capped). Players may ‘straddle’ in the games when they are one position to the left of the big blind. All straddles are double the big blind and are live. Only one straddle per hand is permitted. A player who misses both blinds must post an amount equal to the sum of the blinds. The excess amount, over the big blind, becomes dead money and is not part of the bet. An owed small blind will be dead money. The only exception is if a player chooses to come in on a straddle. In this situation, they will not be required to post the small blind. Buying the button is allowed. Missing the blinds in the first round of a new game is exactly the same as missing the blinds in a pre-existing game. ‘Running it twice’ is allowed on all tables, if all involved players agree. Should only the players involved in a side pot wish to run it twice, they may do so for the side pot only (the main pot will always go to the winner of the first board). In all new games, players will draw for the dealer button. When a new game starts, players on the waiting list will be seated first. Players may lock up seats on a first come, first served basis as they arrive at the table. A player who moves away from the blinds (clockwise) must wait the number of hands corresponding to the number of positions moved, or post a big blind, before being dealt in again. A player who ‘deals off’ (by playing a hand on the dealer button and then changing seats) can move and wait for the blinds to pass the new seat once and re-enter the game behind the button without posting blinds. If a player with a missed blind button changes seats, they must post both blinds, or the player must wait for the big blind. If two players agree to switch seats, 45.a, 45.b, and 45.c apply to both players. If an open seat, is wanted by more than one player and they cannot resolve the issue, priority will go to whoever has been in the game longest. If that cannot be determined, priority will go to whoever asked first. If that cannot be determined, the players will draw cards for the seat. When a seat opens in a game with a waiting list, the floor person will ask the seated players if anyone wants the seat before locking it up for the new player. Once chips are placed on the table, the new player cannot be compelled to move to another seat. A player moving to a different game must have the full buy-in for that game unless he/she is from a broken game and cannot get a seat at the same limit. The game limit must be equal to or lower than the broken game to enter with a short buy-in. If a player is forced to change tables for whatever reason, it is not required that they post the blinds and instead can choose to wait for the button to pass. Players who quit a game and return to the same game in less than three hours must return with at least the same value in chips as when they quit, but not less than the minimum buy-in. In fairness to all players, if a player in a short game (fewer than five players) requests a seat in another game, the floor person may ask if all players desire to draw cards for the available seat(s). In a game with five or less players, a player who causes a game to break by refusing to ante or take the blinds will not be allowed to draw for a seat in another game. Third Man Walking - The third man walking will be any player who gets up from their seat in a cash game after two other players are already away from the table. This player will be required to return to their seat within one orbit or else their seat in the game will be forfeited if there is a waiting list for the game. insufficient open seats in other games of the same limit to accommodate all players, the players will draw cards for the open seat(s). The floor person will draw cards for absent players who have no missed-blind buttons or hold buttons. sufficient open seats in other games of the same limit to accommodate all players, all missed blind buttons accumulated by lobbying players in the broken game will be transferred to the existing game. All table changes must be pre-approved by a floor person. Table changes and game changes must be made immediately. This includes players not playing all the remaining hands until the big blind comes around. However, players in the blinds may finish playing the blinds and their button. Players may leave for up to one hour. If a player is absent for longer than that, the player’s chips will be picked up immediately in a full game with a waiting list. In games that are not full, this may result in the away player’s chips being picked up if a seated player requests the away player’s seat or if the game fills up. Repeatedly leaving the game may result in a player’s chips being picked up before said time limit is met. PokerStars Live Cash Games use the ‘third man walking’ rule. If two players are already away from the table, the third player to leave will have only one orbit of the table to return or risk being picked up and replaced by the next available player on the waiting list. Dealers are instructed to notify the player and the Floor Staff when a third player walks.